Here are some more random pictures I took (mostly just because I had my camera with my, so why not?) 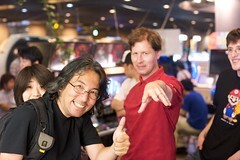 when I went out with februaryfour and some of the DDR guys in Tokyo (including seishinbyou). Rest are past the link. As per usual.